RAILROAD.NET • View topic - Original bridge by nay aug tunnels. I found a hand colored post card image online depicting the original, massive concrete bridge that was washed away by Dianne. Ever since i was up there this past summer i was curious as to what happened. The old ROW is like, still very damaged and largely no space for any more tracks. Makes me very skeptical about re-activation of passenger service over the cutoff. Re: Original bridge by nay aug tunnels. The old ROW is like, still very damaged and largely no space for any more tracks. Makes me very skeptical about re-activation of passenger service over the cutoff. Not following you. This line is quite active via D-L heavy freights plus Steamtown trips so unclear what you mean by the ROW still being damaged. And what more tracks exactly where ? IF and WHEN regular passenger train service comes, it'll be bi-directional on a single track with 2-3 passing sidings between Scranton and Slateford Jct..
At/around Nay Aug is 1 main and 1 long passing/storage track. Been that way ( 2 tracks ) for 60+ years over the creek bridge and thru the tunnel. Before the concrete bridge in the postcard, was the line 4 tracks with 2 double track tunnels? 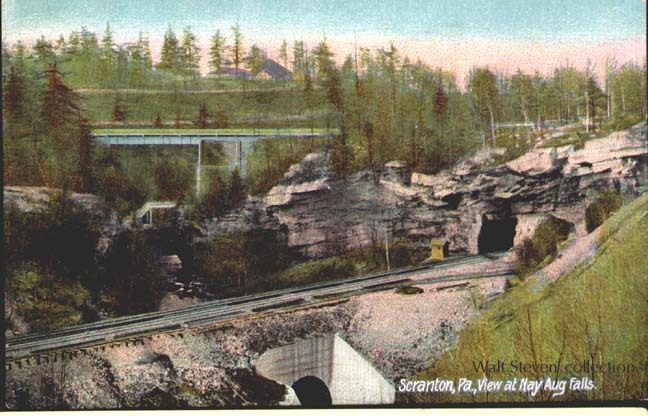 JimBoylan wrote: Before the concrete bridge in the postcard, was the line 4 tracks with 2 double track tunnels?